I am writing this letter to you from a crowded coffee shop on a rainy Monday afternoon in Boston. It’s my day off, but like most of my days off in the last month, it doesn’t quite feel like one. I spent my morning writing a five-page report that I wanted to finish two days ago, answering emails from my supervisors, and convincing the pest control inspector that I heard something crawling across the attic last week. My “me” time consisted of folding laundry and sweeping the hardwood floor of my room while my Oceans station on Pandora played in the background. Just like I can’t be certain that my day off will actually feel like one, I can’t be certain that everything I’m trying to prepare for the week ahead will go as planned. You see, I moved to Boston only a month ago. I’ve been at my current position as a one-on-one instructor at a learning center for less than that. This is my first full-time job (aside from the year of missionary work I did right after college), my first time paying rent, and my first time feeling like every decision I make has the potential to send me right back to the lukewarm state I was in before I made my big move across the country. Needless to say, I feel a lot of pressure to not fail. The uncertainty of the future seems to have found a place to reside, and it sits heavily on my chest. "You see, I moved to Boston only a month ago. 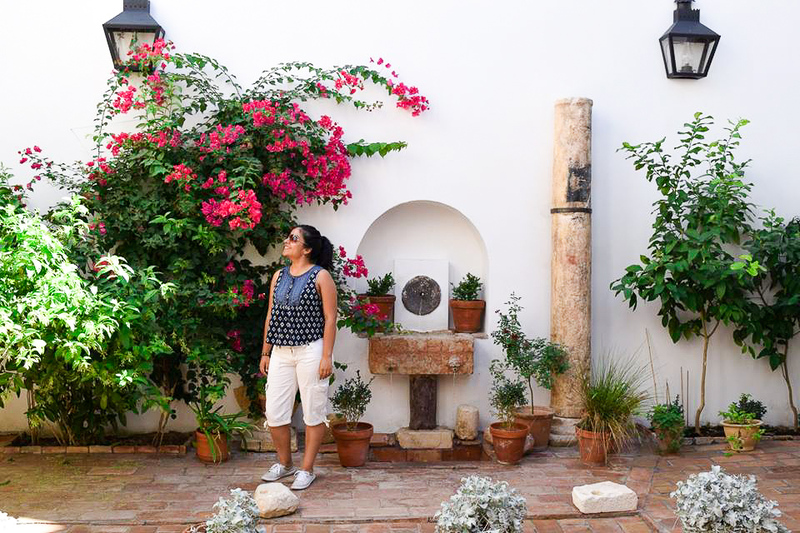 ...This is my first full-time job...my first time paying rent, and my first time feeling like every decision I make has the potential to send me right back to the lukewarm state I was in before I made my big move across the country. Needless to say, I feel a lot of pressure to not fail." 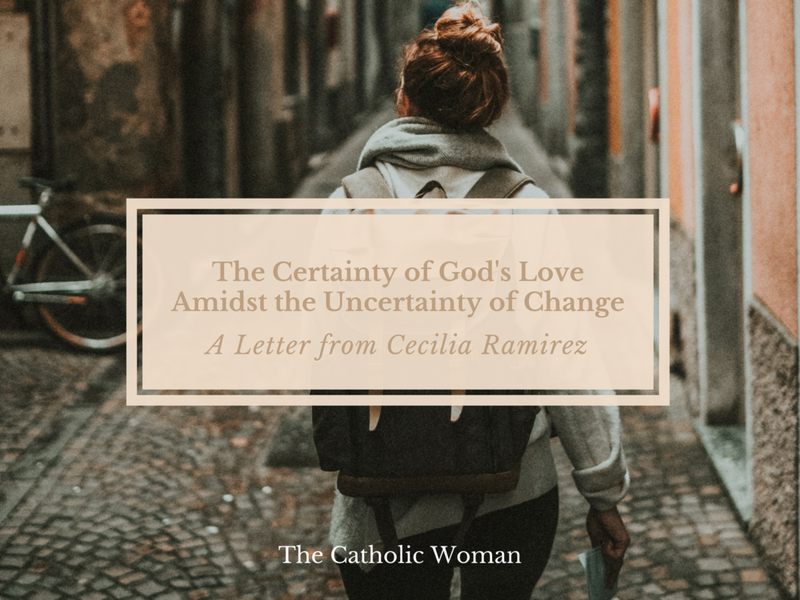 But sister, this isn’t a letter about all the changes and uncertainties weighing heavily in my life right now (though the list goes on and on). 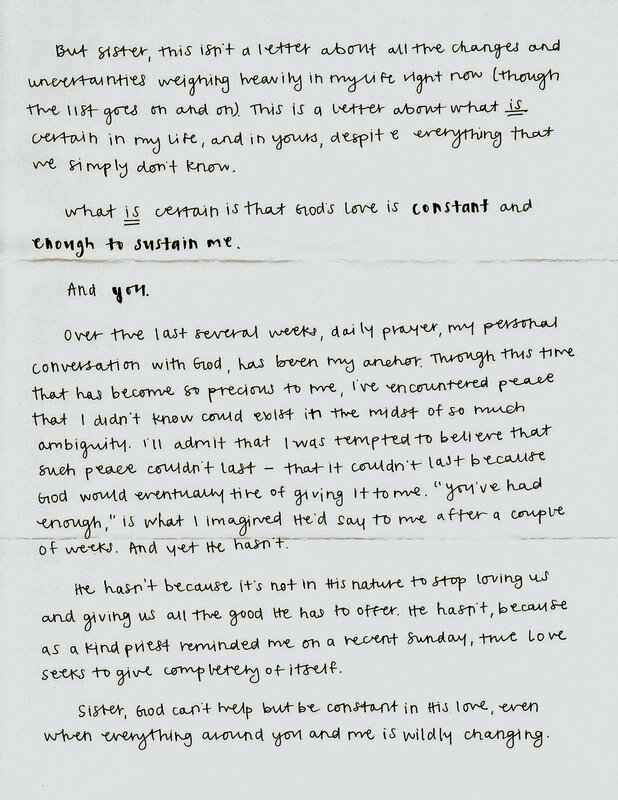 This is a letter about what is certain in my life, and in yours, despite everything that we simply don’t know. What is certain is that God’s love is constant and enough to sustain me. 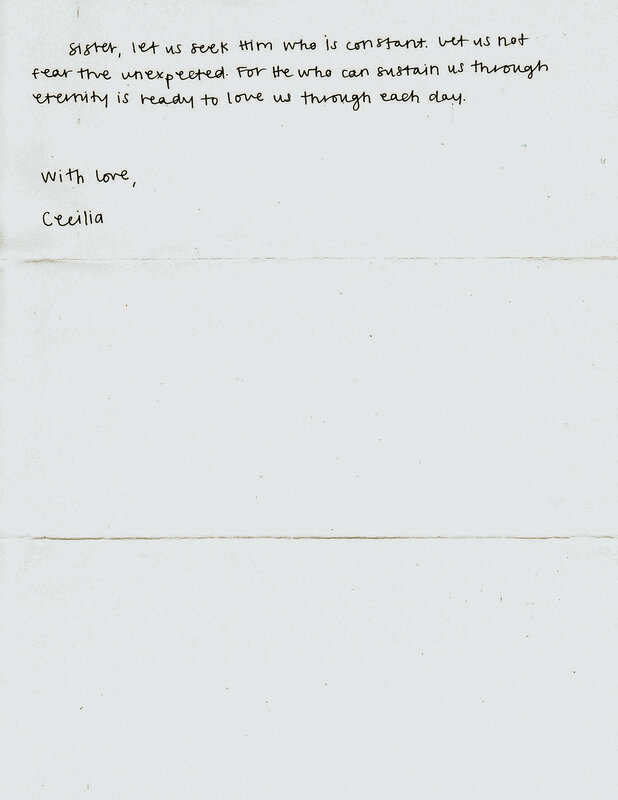 "This is a letter about what is certain in my life, and in yours, despite everything that we simply don’t know." Over the last several weeks, daily prayer, my personal conversation with God, has been my anchor. Through this time that has become so precious to me, I’ve encountered peace that I didn’t know could exist in the midst of so much ambiguity. I’ll admit that I was tempted to believe that such peace couldn’t last – that it couldn’t last because God would eventually tire of giving it to me. “You’ve had enough,” is what I imagined He’d say to me after a couple of weeks. And yet He hasn’t. He hasn’t because it’s not in His nature to stop loving us and giving us all the good He has to offer. He hasn’t because, as a kind priest reminded me on a recent Sunday, true Love seeks to give completely of itself. Sister, God can’t help but be constant in His love, even when everything around you and me is wildly changing. As I’ve spoken to Him in prayer each morning, His gentle words in scripture have reminded me to look for His ever-present love throughout my day. “There is a river whose streams make glad the city of God, the holy habitation of the Most High. God is in the midst of her, she shall not be moved,” (Psalm 46:4-5). I am this river that pleases God, and as I reflect on words like these from Him to start my day, I continue to go through my day recognizing how God is in the midst of my life. When my co-workers stop what they’re doing to teach me something new, there is God. When my housemates lend a listening ear, there is God. When a friend from California sends me an encouraging text by surprise after a long day, there is God. When after a twelve-hour shift I can’t help but smile, there is God. "I continue to go through my day recognizing how God is in the midst of my life. When my co-workers stop what they’re doing to teach me something new, there is God. When my housemates lend a listening ear, there is God. When a friend from California sends me an encouraging text by surprise after a long day, there is God. When after a twelve-hour shift I can’t help but smile, there is God." Sister, we may not know everything that lies ahead, no matter how much we try to plan for it. The five alarms we set each morning might not get us up on time. That long day at work might end up being even longer. The piles of dishes and laundry might not get done. That grocery store run we were supposed to do yesterday might not happen (even when last week’s pasta is all that’s left in the fridge). But if there is anything that I can guarantee you, it’s that if you take a few minutes of your morning to contemplate our wonderful God, His constant, loving presence will always meet you there. Sister, let us seek Him who is constant. Let us not fear the unexpected. For He who can sustain us through eternity, is ready to love us through each day. "Sister, let us seek Him who is constant. Let us not fear the unexpected. For He who can sustain us through eternity, is ready to love us through each day." My name is Cecilia Ramirez. 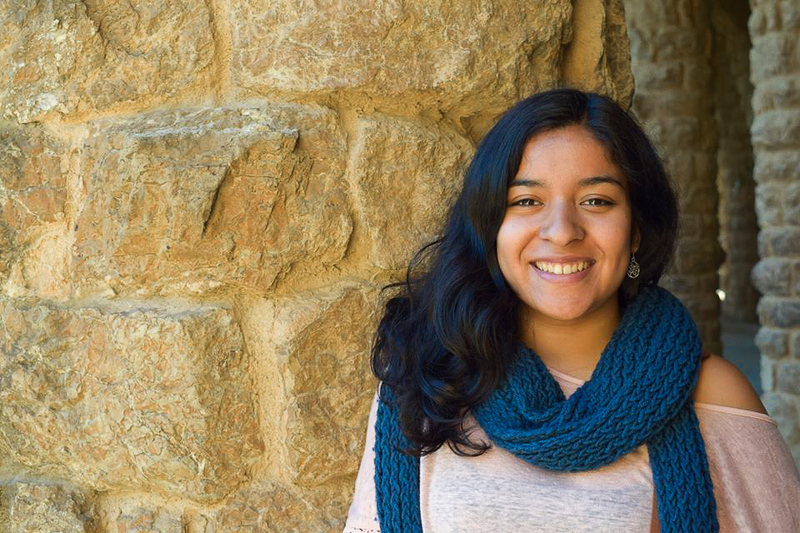 I am a 24-year-old California native, and recently started my first post-grad job as an instructor at a learning center in Boston. When I’m not planning creative lessons for my students, I enjoy writing in my prayer journal, taking long walks in the city, and spending quality time with the people I love. Thank you! You’ll hear from us next Wednesday.